Welp I've endorsed it. Everyone else check this sucker out, it looks good. From your Steam account, go to Community, Greenlight, and I found it instantly via the Search function. Arioch have the developers of this game submitted it for review by any game reviewers or internet personalities? Totalbiscuit comes to mind, perhaps even PewDiePie. As a 4X fan I will see if I can get some people to look into this and once it is out I will see if I can submit a review in a particular site I frequent. already got the preorder in, but upvoted on the greenlight anyway. We have, a few, and started doing press releases, but it's not ready yet for "review" (there are still some key features unfinished), so we want to be careful how hard we push it. Just gave it my upvote. Definitely looking forward to actually being able to play this, Arioch. No steam account, no game fo me? A graphic style I like. It also seems astonishingly similar to MoO2, with som elements of Star Control III in there as well (how the planets iside a solar system can be selected)..
Heck, if I had ime to play, I would be very interested! Any chance for a Linux version? I see someone else on Greenlight had questions about that too. Maybe some day I set up a dual boot with Windows, but till then, I'm 'nix only. [EDIT]Checked the other forum, found this thread. Assuming the PC version does well, I'm willing to consider investing in a Linux port -- but, any OS port, even an "easy" one, is going to be a fair amount of work. We'd need a surplus of money or time to pull it off, and right now, I don't think it's something we can commit to. You don't need Steam; the game can be purchased and downloaded directly from our website. Arioch plz tell me you receive a percentage of whatever proceeds are made from this game, your art is amazing. How long has this game been in the works? If the game ends up making money, I'll see some of it. The initial concepts for what eventually became the Ashdar were done in 2008. More serious work started in 2011. Wowza, that's a pretty significant chunk of time. I will be letting all of my Steam friends know about this game. Is there a race creator or game editor option available? I loved the race creator option in MOO2. I made Squats, Tyranids, Imperial Guard, you name it. There probably won't be a game editor, but it's relatively easy to mod, as most of the game data is in editable lua script files. Up voted and left a comment. Does actually perk my interest now I look at the game more. SIS has been successfully greenlit! Thanks to everyone for your support. 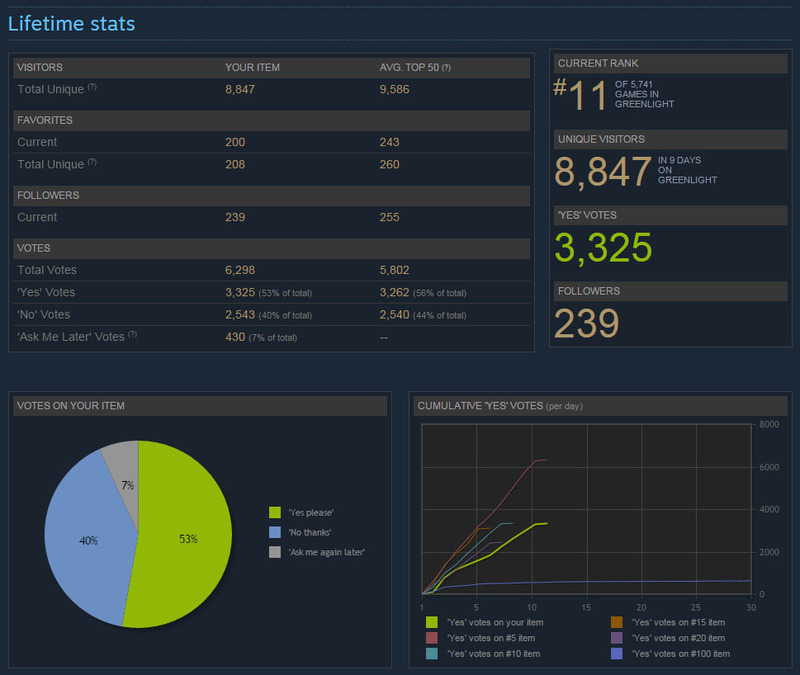 I'm still not sure exactly what the criteria for success is, but the project received 3,325 votes in 9 days, and was ranked #11 of 5,741 games in greenlight. I feel pretty good about that for a little 2-man indie project. Greenlight seems kinda odd to me in that they ask you to rate ANY game, it seems like they would want to target fans of whatever genre the game is in to see how THEY feel about it. I would say I'm sure Valve knows what they're doing, but I'm pretty sure they don't. Congratulations! Now you just have to make an Outsider-verse mod for it! Sven and I took part in a 2-hour Space Game Junkie podcast about Stars in Shadow. It's mostly a lot of chatting, but there is some gameplay shown. It's listed in the Steam store now, not available yet but you can set it to following or put it on your wishlist. What's the price going to be upon release? Will there be a Steam preorder available? Are you thinking about doing an Early Access release for early buy-in? The price hasn't yet been set by the publisher, but it will probably be in the US $20-30 range. There will not be a preorder. Apparently that's something that only the major titles get to do. We might do a short Early Access or go straight to release. Either way, the goal is to be live before the end of September. That's part of the reason why I'm a little quiet lately. The original Homeworld has a lot of great designs. You're the only non-sequel! And quite frankly, I'm almost regretting the money I spent on Stellaris, which is a complete and total hog's breakfast that now they're having the balls to try and throw out obvious cash-grab Day-30 DLCs for that were obviously cut from the main title. Preorder & Early Access: I keep throwing my money at my monitor, but nothing's happening. Homeworld 1: Yes, it does. I would have said Kushan, but they got canonized as the Hiigarans, and before they took the Homeworld back, it would have been more proper, IMO, to call them Kharakans. I have no idea where the word "Kushan" came from, TBH. In response to a comment posted elsewhere, Stars in Shadow will be available on Steam for Early Access purchase sometime Thursday morning, around 8 AM Pacific time, I believe. Those among you who were already involved in the beta should receive Steam keys tomorrow. The beta system will continue, for those who still wish to test rough builds or who just don't like Steam. EDIT: Note that I do have a no 'Early Access' policy but I am making an exception. I'm not sure what surgery Talon needs in order to stop coughing up hard drives, but it sounds expensive, especially since hospitals in this world, not being the TdSmR-verse, don't have stocks of loroi blood.